← Convert px3 to jpg and set resolution via command line? If you don’t have Adobe Acrobat on the computer, if you don’t like to take a lot of steps to get the job done, if you have multiple MHT files to convert to PDF files, I think it will be very hard for you to find a free document converter on line that can help you solve your problem. Usually a free online document can only help you convert a single MHT to PDF file. And it will take a lot of time to complete conversion for you have to upload the file and check the output file in your mail box. To make it worse, unwelcome watermarks would appear on the result file. This article would like to introduce VeryPDF HTML Converter Command Line, a professional command line application which can help you solve all your problems with only two steps. VeryPDF HTML Converter has a command line version and a GUI version. Both can be used free for 50 times. This article prefers the command line version to introduce, just because it is very quick to batch convert documents. You can click free trial to download VeryPDF HTML Converter Command line. After you install it on the computer, go on reading and try to convert MHT to PDF and edit PDF title via command line. 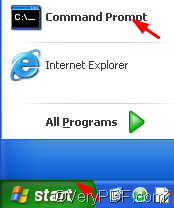 Supposing you are in the XP system, the simplest way to open the command line window requires two steps: first click “Start”, and then click “Command Prompt”. -title "mht2pd" the option that edits PDF title to be mht2pdf here. c:\in.mht represents the input MHT file, which is on disk c.
e:\out.pdf represents the output PDF file which is on disk e.
You can replace the directory and the character string following –title. After you type a command line, don’t forget to press “Enter” on your keyboard. When you see “result=OK” displayed in the command line window, you can go to check the result PDF file. If you would like to buy VeryPDF HTML Converter Command line, please click purchase. This entry was posted in HTML Converter (htmltools) and tagged command line, edit pdf title, mht to pdf. Bookmark the permalink.